WITS is an all-inclusive software application designed to greatly simplify the costly and time consuming task of test data preparation and assembly-under-test fault analysis. 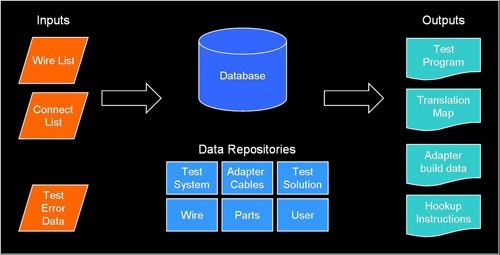 All that is required to use WITS is a wiring database that is an accurate representation of the assembly to be tested. This wiring information is imported into WITS through customized filters, and then used to develop the required test solution. WITS will provide an intuitive, visual and flexible facility for generating wiring test data. It is a client / server application that consists of an easy-to-use Graphical User Interface (GUI) resident on the client PC and a fast, multi-user, Oracle database resident on the server PC. Generate test programs of wired assemblies containing multi-state parts and complex components. Resolve wire segments into circuit networks. Generate adapter cable designs, including bills of material, wiring lists and drawings. Calculation of wire resistances of specific wires for auto-assigning correct parameters. Assigning adapter cable locations to the test system interface. WITS is the only test program generation software application that removes virtually all manual intervention during test program generation. It even has the capability of automatically assigning external energization power to relays, contactors, lamps, etc. 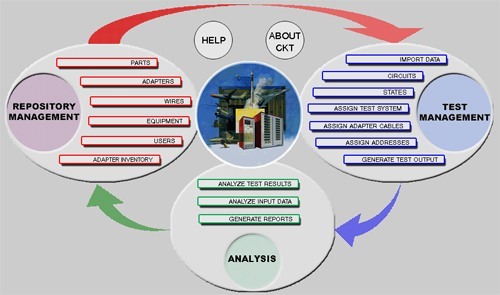 WITS is not only applicable to CKT test system Users, but the application will also generate test programs for Dit-Mco, FACT and Electrotest systems. Furthermore, the application is available in a number of languages: English, German, French, Italian and Chinese. Contact CKT for a comprehensive demonstration of WITS. You will be glad you did!